The temperatures started rising this week and we actually saw that big ball of fire in the sky for a change. The snow has melted quite a bit and the backyard is full of land mines that the dog has deposited over the past several months of not being able to get back there to pick anything up. Bring on Spring! Like every Golden Retriever we've ever had, Blue was anxious to get in the water the second there was an open hole for him to access. I screwed up and threw the ball in the water thinking it was wide open. Turns out there was still a thin layer of ice that he discovered after sprinting down there and diving into it headfirst. It was a bit of surprise for him, but he quickly turned himself into an ice barge and started cracking through all the ice to get to his ball. As you can see, he was pretty proud of himself for his accomplishment. We've been walking by this stream the past couple of weeks and have been watching as the water gets stronger and stronger as the temperatures rise. It also has been providing shelter to an inordinate amount of ducks who are waiting for the lakes to start opening up as well. Signs of Spring are everywhere! Knowing Minnesota, that means the blizzards will be starting again very soon. We spent a lot of time in restaurants with friends and family this week. Avery was home this week and what college boy doesn't love spending time with his grandmother for Spring Break? So we made his wish come true. I had some work going on in Downtown Minneapolis, so I was fortunate enough to have lunch with my old buddies, Will, Chris, and Mike. What a good looking crew of dudes. On Friday night, we went to one of our new favorite restaurants, Whiskey Inferno, in Savage. We connected with our old friends, Tom & Kellie Wolf. Tom had received a recommendation from a friend to order the Butcher's Feast which was basically a huge bowl of meat and other goodies. It was delicious and so much food we probably could have had another couple to help us finish it! 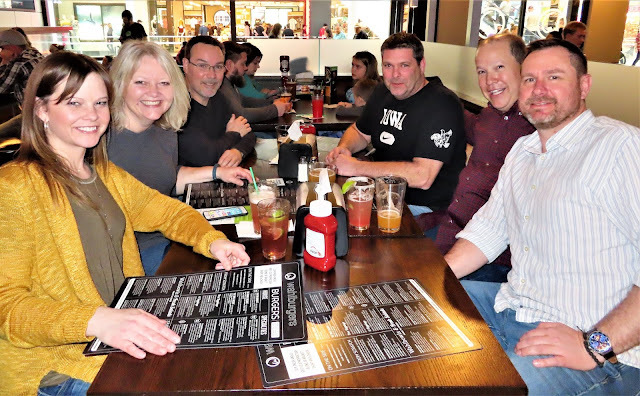 On Saturday, we went to the Mall of America to Wahlburgers to be part of the Funky Bunch with Marky Mark and Family. Chris Wagler and Matt Amos were in town dropping off a friend at the airport so Jason, Jen, Miss Sheri, and I met them for dinner and some laughs. Not necessarily in that order.